The bridge has six different suggested handrail alternatives, as illustrated above. Where "H" is the Fall Height. The above are suggestions only. 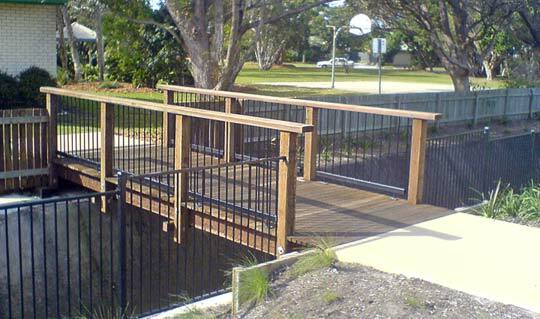 Our demountable range of bridges based on sawn timber was designed for the needs of National Parks. Bridges built on logs are unsuitable for this application as the logs can weigh in the vicinity of one tonne each and need good crane access. Demountable bridges are suitable for spans up to 5 metres (6 metres with the Barup truss option) sited on remote bush tracks where every item must be carried to the site. The heaviest component on the longest bridge weighs 120kg.